Lots of news from Indian Country lately! In time with the coming Aboriginal Day Live celebration, my song Oh Yes Oh Yes has hit #1 on the National Aboriginal Music Countdown this week! The thing is, there’s room for everyone. I’m stoked to be topping that chart this week, and look forward to who will be climbing it next! 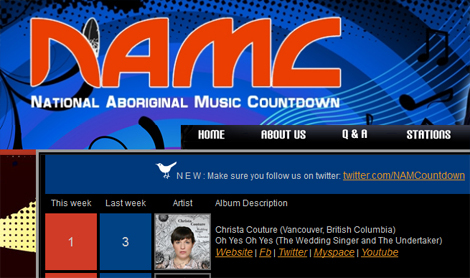 Check out the chart here: aboriginalmusiccountdown.ca! @christacouture takes over the #1 spot with “Oh Yes “Oh Yes” she’s at @ADL2012 at the Forks! Previous: The First Single from The Living Record is Coming June 19th!